– Wolman™ DeckBrite is wood cleaner and preps stains for re-coating. Not designed to strip wood or deck stains. – We had trouble getting the powder to dissolve into the cold water. This caused some clogging with the pump sprayer. Not sure of the “blue” tint this product creates. Did not seem to harm the wood. – The IPE wood had been restored to about 80% of its natural state. There remained a small amount of graying. – The Wolman™ DeckBrite is very good wood and deck cleaner. If you need to prep your deck prior to application then using this product would be effective. There are better Oxygenated Deck Cleaners on the Internet (Restore-A-Deck) but if you are shopping at a big box store and need to choose between Wolman™ DeckBrite and other brands, we would suggest the Wolmans. The condition of Deck: Unstained graying wood. Wolman DeckBrite is an amazingly great product. After 10 years of my having used some 3 or 4 other cleaners, this is the best I’ve tried – for ease of use, for powerful results and for safety to the plants and grass surrounding my deck. Based on my experience, the cause of the clogging you described in your review may have been your failure to have followed the instructions — which call for lukewarm (not cold) water, and for stirring some 3 to 5 minutes until the entire solution has turned white in color. DeckBrite just cleaned 2 years of grime and mildew from our deck “simply” by applying, letting it foam for 10 minutes, scrubbing some dirtier spots with a short-bristle floor scrub-brush, then hosing off – without the time-consuming trouble of covering and uncovering the plants! It foamed and cleaned best in areas where I had only lightly wet beforehand (again, according to the instructions). In other areas where I had pre-sprayed more water, it foamed less and required more scrubbing. If you use Wolman Deckbrite, do you need to use a brightener after it? I know some cleaners can affect the pH of the wood so usually a “brightener” is recommended afterwards to neutralize the pH. This almost seems to be a hybrid “cleaner/brightener” in one. Their label is misleading. Is not a “wood brightener” but a sodium percarbonate deck cleaner. This will raise the pH balance and should be neutralized with a wood brightener, even they do not sell one. Strange how they market this. Restore A Deck Brightener or Citralic. I used HD-80 to strip my rough pine siding- what brightener should I apply? BEFORE I re-stain. On the off chance that I utilize wolman deckbrite to prep the deck before recoloring why do I have to apply a brightener? Wolman promotes their item as a wood cleaner and brightener. Their product is really just a cleaner. It always helps to brighten/neutralize. Below, you note that Deckbrite does raise ph level and thereby brightens wood. Wondering then if cleaner/brightener products like Wolman Deck"brite" (and Olympic Oxy-Deck) can also serve as a "brightener" for use after a stripper used like RAD stripper or HD 80 ? (ask in part as I have deckbrite & oxy-deck supply on hand) thanks. The two you mentioned are not acidic in nature so no they will not work to neutralize a stain stripper. Very easy to apply and took cedar back to original color of wood. Had very few spots of dark tannin oil stains that I used a cleaner spesifically made to clean those. I saw a Wolman product at the Big Box store today while looking for wolmans Deck Brite. Its called (Wolmans) Deck Cleaner. It is to be hooked to a garden hose, and has a valve on it that you can switch from Off to Spay (solution), or Rinse. There is no info on what the chemicals are in the container. Anyone used this yet? Never used it and it most likely is soap and bleach concentrate that will mix with water at about 1:8 parts. Expensive for $45 for a quart of bleach. It was only $7.49 at Menards. Says it will do 1500 sq. ft. I used DeckBrite on my cedar deck. The deck has 2-3 coats of Cabot Clear Solution. The deck had grayed in exposed areas. I followed the instructions with DeckBrite. I applied with a stiff brush, and used a high-pressure hose to rinse.The cleaner/brightener turned into a weak stripper for my deck. It cleaned up the grayed areas, but stripped the less exposed areas. Now I have a bit of a mess on my hands. Any suggestions on how to proceed? I am putting on Defy Extreme once I get the deck properly prepped. But the DeckBrite really created a lot more work than I expected. It would seem I have to go back to using a stripper, and then a brightener (again). David, you need so strip and brighten all of the deck. You need to do this no matter what as you cannot apply Defy on top of another stain brand such as Cabot. Thanks. Any suggestions on a stripper? You only reviewed 3 – I know not to use Behr products, but the other two I need to wait weeks for. Any feedback on Jomax or Cabot Stain Problem Solver Wood Stripper. David, Cabot makes a decent stripper for a big box store. My Wolman Deckbrite did not come with any directions. They said it was under the lid , no luck. Is it possible to send me directions? Jim, we do not have any directions. 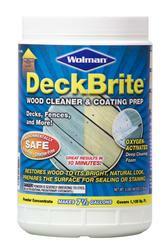 If I use wolman deckbrite to prep the deck before staining why do I need to apply a brightener? Wolman advertises their product as a wood cleaner and brightener. Yes as their product raises the pH level. Jerry, their DeckBrite is sodium percarbonate which is a caustic. If I use deckbrite to clean the wood do I need a brightener afterwards? Fernando, yes that would be best. I stripped Wolman Durastain and then used deckBrite afterwards. I am going to apply Defy Extreme. Is there anything else I need to use before applying the stain? Teresa, as long as the wood is free of the wolman then you should be okay to start the staining. can you use this product to clean algae and mildew or mold off roof asphault shingles ? Stan, I am not sure on that. Probably would work but I would ask the manufacturer.